Especially in the fall and winter months, a fireplace not only looks great, but it can become mandatory as well. During the holidays, when guests and family are visiting, the fireplace can be the spot where everyone gathers around to talk. Anyone who has a fireplace in their home should help it stand out and attract even more attention by surrounding it with a great looking fireplace mantel. A fireplace mantel does not only frame your fireplace, it provides a shelf to display your favorite family photos and other decorations, and it can also be useful to hang stockings at Christmas-time like families did in the past. Some of the most popular types of fireplace mantels during the holiday seasons are rustic mantels. Rustic fireplace mantels create a warm and cozy feeling that pairs perfectly with a roaring fire when it is snowing outside. They can make any home, whether it is in the middle of the city or out in the country, feel like a wood cabin or rural hotel. Rustic fireplace mantels come in a wide variety of materials and colors. 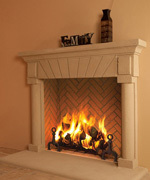 The carved intricacies of these mantels are perfect for natural stones like marble, sandstone, and travertine. Also, for those who cannot find the exact mantel they have in mind amongst the many that are displayed in the showroom, custom fireplace mantels might be their best option. A designer who knows all the ins and outs of these mantels can sit down with them and help them choose the design, stone, and color to match the decoration of the room precisely. With so many people now having fireplaces installed in their homes, a fireplace mantel is the best way to make your fireplace rise above the competition.